This is a mixed six-pack of beers from DuClaw Brewing. 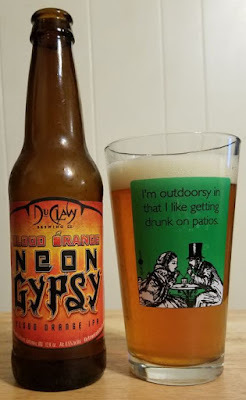 I don’t love the Blood Orange version of DuClaw's Neon Gypsy IPA, but I do like it better than the regular version. The blood orange in this variation seems artificial, but it covers up the astringent quality that put me off the original. This pours bright rust/orange with a fair amount of foam. The aroma is dominated by the sweet orange flavoring, but there is also a little bit of pine/citrus hops character, too. The flavor is big on the orange, but the finish has a little bit of kick. It’s alright. Sometimes I really don't know. Sometimes I think the problem may be the way I’ve conditioned my palate. Gigantic sledgehammer IPAs and steamroller stouts may have left me ill-tuned to appreciate milder styles. 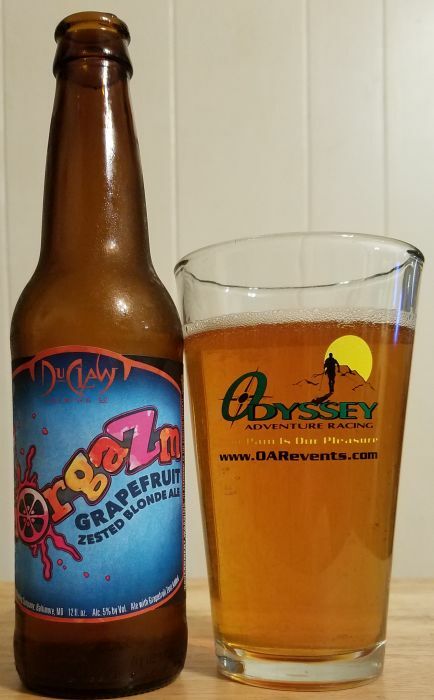 There’s nothing really wrong with DuClaw's Morgazm Blonde Ale. It just doesn’t do anything for me. It pours slightly cloudy yellow/orange with a little foam. The aroma is mild, sweet citrus. The label says grapefruit but this reminds me more of tangerine. The flavor is the same, tangerine, maybe a little lemon, but more sweet than anything. It doesn’t taste bad but I don’t want any more of it. 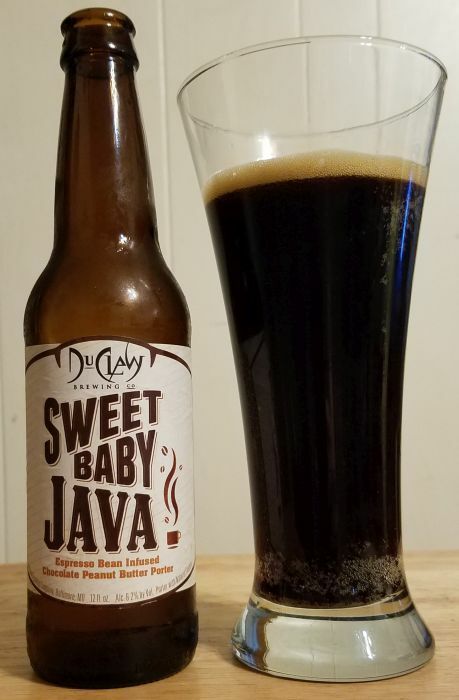 I was initially underwhelmed by Sweet Baby Jesus, DuClaw's peanut butter porter, the first time I tasted it. I have come to like it more over the years, its a pretty good dessert beer. This coffee infused version, called Sweet Baby Java, sounded like my kind of thing, but the coffee is hardly there at all. To my taste this is basically no different from SBJ. It pours dark brown with quick fading head and smells like a standard porter; chocolate roasty malt with a little bit of coffee (and, yes, some peanut butter). The flavor is the same, and it closes sweet. Sure, there’s a mild coffee quality, but I already picked up on something like coffee in the original recipe. This isn’t bad, its just not really anything new. Now, with this beer, you can taste the coffee. And I like it. 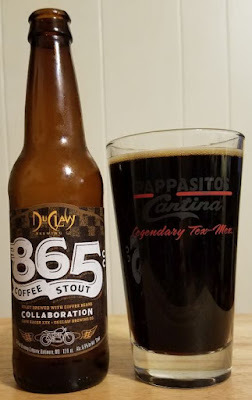 DuClaw's 865cc is a fairly simple, straight-forward coffee stout, but that's a good thing. It pours black with a little bit of fast-fading suds. The aroma is coffee, rich malt, a little bit of chocolate. The flavor is all coffee and malt, but that's what I was hoping for. Some of the coffee stouts I’ve tasted recently have played the coffee card delicately. This one is unapologetically coffee forward. Nothing wrong with that. 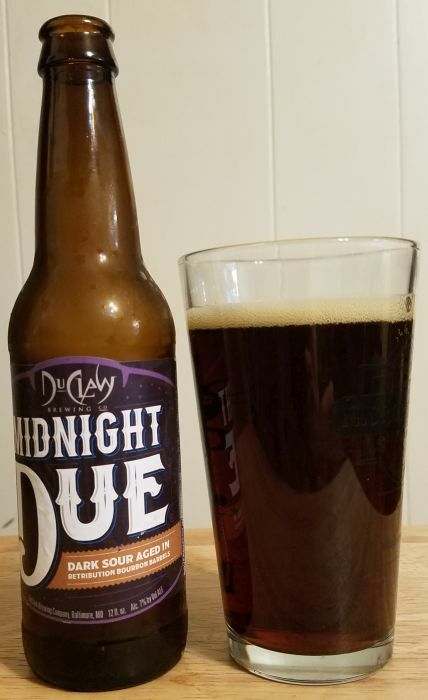 Midnight Due is DuClaw's barrel aged sour. It smells very good but somehow fades on the flavor, and that's disappointing. This beer pours dark brown with copper highlights and little foam. The aroma is really nice, oak barrel aging and sour tone combine into a mix of red wine vinegar, vanilla, rock candy and spice. But the flavor is ultimately a little flat, only a fairly straight-forward tart blast comes through with no complexity at all. Ultimately, between the tempting aroma and the so-so taste, this is an ale that writes a check it can’t cash. 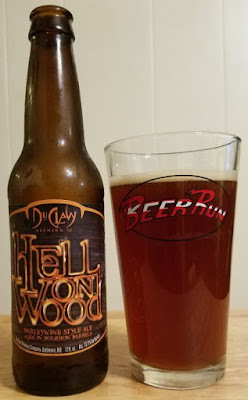 This last one is the best of the six, and easily the best thing I've ever had from DuClaw. Hell On Wood barrel aged barley wine is a fantastic example of a high ABV, oak aged barley wine. Strong, rich, and smooth without being overtly hot or medicinal. My bottle was from last year's brewing. I don’t know if it would have been this good had it not been aged a bit, but as it is right now, this is a damn fine bottle of beer. It pours bronze/brown with a bit of foam that quickly fades. The aroma is great; bourbon, oak, vanilla, butterscotch, a little pepper, a little bit of citrus. The flavor is all of that and closes strong and very rich, with a little alcohol curl in the nostrils. I completely enjoyed every drop of this beer. The ABV, just north of 13%, is as well hidden as it could be.